Winter can be “the most wonderful time of the year.” But it can also be the most dangerous time if precautions aren’t taken to keep your home safe. Homeowners should prevent winter dangers by winterizing their homes in advance – before freezing temperatures set in – and ensuring that all systems and winter precautions are taken. Identify wiring that looks frayed or damaged, which exposes it to weather damage, particularly from ice and snow. Remove bird nests, spider webs and debris that could pose a fire hazard should there be electrical damage. Check lights and electric holiday decorations to ensure their wiring is sound and that they’re mounted securely so as not to pose a danger to those in or out of the house. All electric lights should have tight-fitting connections away from walkways where they could be tripping hazards, and should never be run under rugs or carpeting – this could cause a fire. Roaring fires in a fireplace are lovely things in the winter, but should be handled with the respect they deserve. If you have a traditional wood-burning fireplace, have a professional clean the chimney annually. Review safe fire-lighting procedures with your family to prevent accidents. This includes opening the damper before lighting, using dry, seasoned wood, keeping a screen between you and the fire, and never using lighter fluid. Do not burn plastics or holiday wrappings in your fireplace due to toxic fumes, and keep flammables a good distance away from the fireplace. If your fireplace is gas-fueled, ensure the flames are blue. If any other color, call a technician to check it out. Most importantly, ensure all smoke and carbon monoxide detectors are properly installed and operational. Tree branches are heavy, and a mix of ice and snow only adds to the weight. Before the winter season advances, trim branches that overhang the house or electrical wiring. If power lines are compromised from a fallen tree or limb, do not attempt to take care of the problem yourself; call your power company. In fall, leaves and other debris can accumulate in a home’s gutters, creating ice build-up. Clean out your gutters to make sure water can pass through easily. This will also help to avoid ice dams that can back water up into your roof or attic. 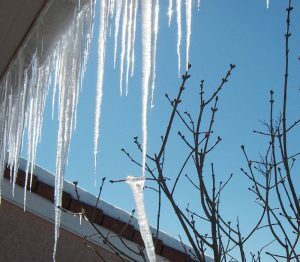 During the winter, keep watch for icicles along gutters or icy patches on the roof which can indicate leaks. Frozen pipes can cost a homeowner thousands of dollars if they rupture. Insulate exposed pipes, especially those along exterior walls. If the weather drops below freezing, run the water at an interior faucet with a consistent drip. This will keep water flowing, preventing most cases of freezing. Heavy, wet snow can tax any roof. While snow will often slide off if too much accumulates, you could begin to see leaks and cracks in your ceilings and upper floors. If your roof is sagging, you hear popping noises above you, or you notice fissures or leaks, contact a professional service to help you safely remove excess snow. Another winter danger is icicle formation. Break off icicles when they’re small with a broom or shovel handle. If they grow too large, they can cause serious injuries when they fall. If a large icicle forms too high to be knocked down, make sure others are made aware of its presence so that area can be avoided. While roads and public walkways often fall under municipal responsibility when it comes to clearing snow, your home’s walkways are typically your responsibility. When they’re obstructed by snow, your walkways can pose a threat to all who have to tread them. Most states have laws requiring you to shovel your walks. In Virginia, depending on the amount of snow fallen and the county, you could be cited or fined if your walkways aren’t cleared within a specified amount of time after snowfall. If you are unclear about how to make your home winter-ready or need a professional construction consultant when building or remodeling your home, contact Först Consulting Group. We can also provide estate management services when you are away from home. This includes clearing snow and ice, picking up mail and packages, and walk-throughs of your home to inspect for problems like burst water pipes or electrical outages. Prevent winter dangers by being proactive, and contact Först Consulting Group today.